Spend a day at the spa with Mary-Kate. Start by giving her a manicure and pedicure - just soak her hands and feet in icy cold water to reveal her favorite nail color. Then, transform her spa chair into a beautiful vanity and help her get ready for a fun night out. Use the applicator to change her eye makeup and lip colors for a dramatic new look. 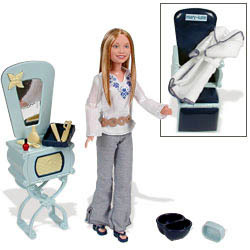 Set includes: Mary-Kate doll, outfit, spa robe, sandals, chair/vanity, foot bowl, hand bowl, nail tray, hairbrush, lotion bottle, pretend nail file, sponge applicator, poster and instructions. Doll measures approximately 11.5 inches tall.